It is one thing to trash Jim Lehrer’s moderating behind his back. It’s even worse when you then bring him on your show to praise his performance after you trash him. No one does this better than Morning Joe’s Scarborough who did a complete 180 on his analysis of Lehrer’s moderating skills. So the bottom line is, they're saying that the President couldn't take care of himself and that you let Mitt Romney run all over you. What do you say to that? Scarborough apparently forgot that he is one of those people who believe Lehrer got “rolled over” as debate moderator. The entire panel, which included liberals Mika Brzezinski, Harold Ford Jr. and Mike Barnicle, all defended Lehrer but failed to point out that numerous MSNBC employees, including their own Scarborough, had been viciously critical of Lehrer’s role. Before Scarborough called out his fellow MSNBC employees for criticizing Lehrer, he should have admitted he was one of them instead of lying to Lehrer’s face. JOE SCARBOROUGH: And if he's smart, he won't do 13. BRZEZINSKI: Friend of my family, Jim Lehrer. SCARBOROUGH: If he's smart. If he's smart, he'll stay away. You know, you should go fishing, Jim. BRZEZINSKI: Jim's out with a new book that I feel could be about this show, “Tension City: Inside the Presidential Debates." Very good to have you on board this morning. JIM LEHRER: Mika, I'm delighted to be here again. SCARBOROUGH: So I hope you've stayed off the internet over the past week or so. There's some crazy people out there, Jim. LEHRER: Yes. Let's just say I heard about them. A few other things that have seeped through. It's nuts. SCARBOROUGH: It is nuts. Mike [Barnicle], what did these people do before the internet? LEHRER: That’s it, that's the problem. BARNICLE: We do not live in a nation of 300 million newspaper columnists, okay? Put your name on it. If you're going to make a personal assault on someone's ethical bearing, professional bearing or whatever, put your name on it. SCARBOROUGH: The amazing thing is a week and a half ago Republicans were calling me, you know, a prostitute and this and that and the other because they were angry because we were tough on Romney. Romney had a good debate. And this past week, I have been called a racist and a bigot. And it happens to all of us. LEHRER: I'll give you a list of everything I've been called in the last couple of days. SCARBOROUGH: Right, exactly. So the bottom line is, they're saying that the president couldn't take care of himself and that you let Mitt Romney run all over you. What do you say to that? LEHRER: Well, 67 million people saw what happened. I think there was a misunderstanding probably of the result of the commission and i probably didn't explain it ahead of time that, we, you know, this is a progression of presidential debates that's been going on for several years now. And the dream has always been to have an open debate where the candidates stand and look at each other and confront each other. And that's what this was. LEHRER: And that's exactly what happened. 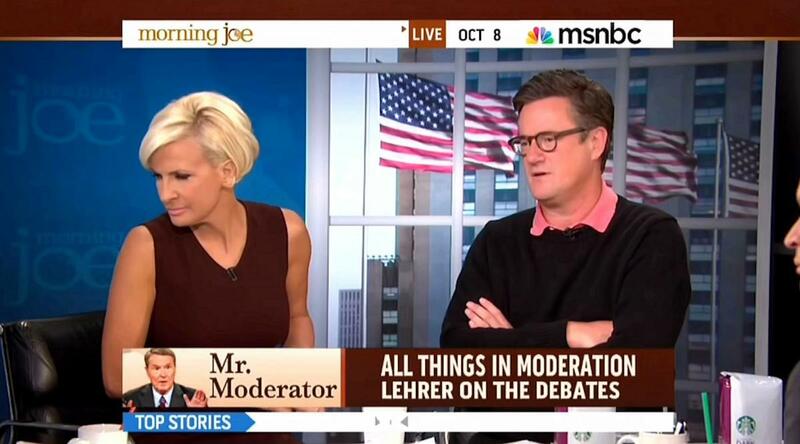 SCARBOROUGH: More of a Lincoln-Douglas-style debate than where we're going in debates. LEHRER: Absolutely. Because the theory of the commission -- and I agreed with this enthusiastically -- is that if you don't have an open -- if you don't have open presidential debates, what you have is a presidential campaign that is governed by canned stuff, canned speeches, canned commercials. And here for the first time in American political history, you had an incumbent President of the United States on a stage being confronted by his opponent and the idea -- and they were talking about things that mattered -- and yes, there was some -- and we went into it. I went into it at least fully prepared to just let it run. See if it would work. As long as they didn't start talking about baseball or something that was way off the mark. As long as they were talking about things that mattered. And that's exactly what they did. SCARBOROUGH: You said your job was to stay out of the way. LEHRER: Absolutely right. And that's the reason that people were a little disconcerted, some of the tweeters, the twitterers and the wawas because they expected an old-fashioned debate. Two-minute canned answers and one-minute responses. But this was not that. HAROLD FORD JR: Had he gotten in and tried to influence one side or the other, or got in and cut off questions, you'd have been equally criticized. I think you did a fantastic job. You allowed America to see these two candidates go head to head and allow both of them to share their views, confront each other, try to correct one another and then lay out their own vision. That's what all the debates should be like. LEHRER: Exactly. And that -- I'm hoping that they will be from this point on. FORD JR: I hope they use you again. LEHRER: No, no, no, it's not about me. It's about this format and if it is seen as a positive development, then people will -- whether it's at the local level, the state level or the national level, the presidential level, that they will, okay, we've seen -- if the President of the United States can do this and the challenger to the President of the United States can do this, we can all do this. SCARBOROUGH: Mike, I thought it was sad. I really did. I thought it was sad is that some of the president's supporters that were looking for an excuse decided to attack the moderator as if the President of the United States wasn't tough enough to handle things without having a schoolteacher come in and slap Mitt Romney on the wrist with a ruler. BARNICLE: You and Jim just employed the key phrase in the debate. It's a debate between the President of the United States and another man, a former sitting governor, who wants to be president. That's the debate. That's it. The moderator's role is to stay out of the way. If the President of the United States didn't have the wherewithal, which he didn't the other night, to mention 47%, or to mention whatever aspect of Romney's candidacy he deemed important, it's not up to the moderator to say, uh, Mr. President, you want to jump in here with the 47%? What's that going to do to the moderator? FORD JR: He would have been criticized had he done that. BARNICLE: Anybody would have been. LEHRER: Oh I would have been…correctly too. BARNICLE: But the world, the culture that we live in now, it's not a news culture. If you sit here -- if I sit here and say to you, Harold, you know, there's been a great deal of misunderstanding about Mitt Romney, and it's probably Romney's own fault, but he's kind of a nice guy, you get lit up. BARNICLE: These people, what do you mean, he's a nice guy? You know, if you say that about the president, you know, he's a good guy. You get lit up. So, you're going to get lit up either way. LEHRER: There’s also the misunderstanding, understandably because people are used to one-on-one interviews. And they expect -- some people expected this debate to be kind of simultaneous one-on-one interviews. That I would ask the president this question, and then I would ask that question, et cetera, et cetera, et cetera. But that's, as you say, that's not what this is about. This was about those candidates. SCARBOROUGH: So Jim, this was your 12th debate. You've written about debates. SCARBOROUGH: You got that from 41, Bush 41. SCARBOROUGH: And who actually said the debates, and he didn't like them. SCARBOROUGH: He said I'm not good at them. They're contrived. They're showbusiness. And there seems to be an ongoing debate about the debates. His own son, 43, said he likes them. That he thinks that you can figure out what people learn in them. So there is even a debate about whether these debates fulfill a useful purpose. LEHRER: Exactly. And that's why I think last Wednesday's debate is going to change that debate. It may change it forever. Nobody's ever going to be able to argue, oh, these things don't matter. They matter. LEHRER: you mean on Wednesday? LEHRER: Oh of all the debates. SCARBOROUGH: including Wednesday where you said, okay, that's going to change this race. LEHRER: No. No. My mind is far, far away from things like that. I can't clutter my mind thinking about that sort of stuff. It's about trying to do what I'm supposed to do, which is -- and concentrated on my job and listening to what's going on and not judging them. When that debate was over even Wednesday night, I wasn't sure what the result was and how it was going down. Because also, remember, I'm sitting -- you know, from here to there very close, this is being watched on television screens. By 67 million people. It's that what goes down with them that matters. I'm the last one to judge, hey, Billy Bob whipped up on Sammy sue. I mean, you know, forget it. I'm not going to make judgments like that. BRZEZINSKI: The book is "Tension City: Inside the Presidential Debates." Jim Lehrer, great to have you back on the show.